THIS COUNTY was formed from Steuben, Chemung and Tompkins, April 17th, 1854, and named in honor of General Philip Schuyler. It is situated upon both sides of the southern extremity of Seneca Lake; is centrally distant 160 miles from Albany, and contains 352 square miles. Its surface generally is an undulating and hilly upland, divided into two distant ridges by the deep valley of Seneca Lake and its inlet. The highest land in the County rises from 600 to 1,000 feet above the lake, and from 1,200 to 1,600 above tide. Along the shores of the lake a high bluff rises, from 100 to 300 feet in height, and too steep for profitable cultivation. Further from the lake the hills are bordered by long, gradual slopes, and are tillable to their summits. The extreme south part of the County assumes a more hilly and broken character. The principal stream is Catharine’s Creek, flowing into the head of Seneca Lake, through a deep, narrow, winding valley, bordered by steep hill-sides, from 400 to 600 feet high. There are numerous falls upon this creek, affording abundance of water-power. A marshy region of considerable extent lies near the mouth of the creek. Mead’s Creek, a tributary of Chemung River, drains the south-west corner, and Cayuta Creek the south-east corner. The other streams are all small creeks and brooks, most of them flowing into Seneca Lake. A few streams, which rise in the north-east part of the County, flow into Cayuga Lake. Little and Mud Lakes, on the west border, discharge their waters through Mud Creek into Conhocton River. Cayuta Lake is a beautiful sheet of water in the eastern part of the County. Hector Falls, upon a small stream flowing into Seneca Lake from the east, is one of the most beautiful cascades in the State. The rocks of the County belong chiefly to the Chemung and Portage groups, the former occupying the south part of the County and the latter the north part. The Genesee slate outcrops along the deep valley of Seneca Lake, in the extreme northern part. There is very little good building stone in the County; the thin-bedded sand-stone, separating the thick beds of shale, being the only stone suitable for the purpose. Deep deposits of drift cover the shale in many places. Upon the highlands the soil is clayey and gravelly, derived chiefly from the disintegration of the shales, which is in many places underlaid by hard-pan. In the valleys the soil is a gravelly loam, intermixed with alluvium. The principal pursuit of the people is agriculture. Spring grains are raised to considerable extent, and great attention is paid to stock raising, dairying and wool growing. The climate and soil are better adapted to pasturage than to tillage. Fruit is an important article than to tillage. Fruit is an important article of culture, and all kinds adapted to the climate succeed well. There is some manufacturing at Watkins and Havana. In 1854, Delos DeWolf, of Oswego, Edward Dodd, of Washington, and Vivus W. Smith, of Onondaga, were appointed Commissioners to locate the County buildings, and fixed upon Havana as the County seat. The action of the Commissioners was resisted by the Board of Supervisors, and by them the County seat was located at Watkins, at the head of Seneca Lake. A Court House was erected at each village; but the Courts decided in favor of the action of the Commissioners, and April 13th, 1857, the Legislature passed an act confirming the location of the County seat at Havana. This act was confirmed by the Supreme Court, in April, 1858. In 1867 a law was passed removing the County buildings and Courts of Schuyler County to the village of Watkins. New buildings have been erected on an eligible site, and the County seat is now permanently located at Watkins. The public works in the County are the Chemung Canal, extending from the head of Seneca Lake south, through the valley of Catharine’s Creek, uniting with Chemung River at Elmira; the Elmira, Jefferson and Canandaigua Railroad, extending along the west shore of Seneca Lake, to Watkins; and the Chemung Railroad, extending south from Watkins, along Catharine’s Creek, to Elmira. These roads are now known as the Northern Central Railroad. The Tioga Patriot, started at Havana in June, 1828, by L. B. & S. Butler, and was continued only a short time. The Havana Observer was started in 1830, by F. W. Ritter, and was soon discontinued. Life in the Country and Havana Republican. It was discontinued in 1850. 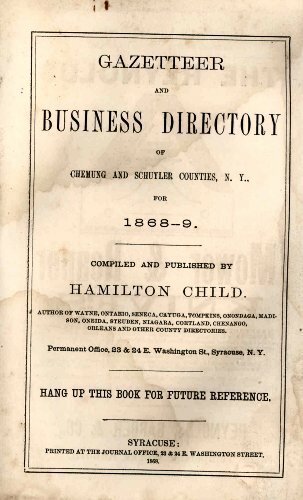 The Democratic Citizen, and was issued by J. I. Hendricks, until 1850. The Jefferson Eagle, and was continued a few months. The Corona Borealis, a literary paper, was published at Jefferson about the same time. The Watkins Republican was started in June, 1854, by S. M. Taylor. It passed into the hands of J. K. Averill, and subsequently into those of M. Ells. THE SCHUYLER COUNTY DEMOCRAT was started in 1863, and is now published by Wm. H. Baldwin. THE WATKINS EXPRESS, now in its 15th volume, is published by Levi M. Gano. THE HAVANA JOURNAL was established by Waldo M. Potter, in September, 1849, and continued by him until the fall of 1851. It was then published by J. Wesley Smith until the spring of 1853, when the establishment was purchased by John B. Look, who conducted it until the spring of 1864. In May of that year, E. A. Hotchkiss purchased a half interest, and under the firm name of Look & Hotchkiss the paper was conducted for about six months. Mr. A. E. Fay then purchased the interest of Mr. Hotchkiss, and continued as a partner of Mr. Look until the fall of 1865. In September of that year Hon. Charles Cook purchased the establishment, continuing the paper as its editor and proprietor until his death, in October, 1866. The Journal was then published by the heirs of Mr. Cook until February, 1867, at which time it was sold to its present publisher, A. G. Ball. The Journal is now an eight-column paper, and has a large circulation. The expedition of General Sullivan in 1779, passed through this County after the battle of Newtown, so fatal to the Indians. As the route of the army lay through narrow defiles where heavy artillery could not well be transported, this, with wagons and such portions of the baggage as were not wanted, and was sent back to Tioga Point. Only four brass three-pounders and a small howitzer were retained; and the whole army, put upon short rations, moved towards Catharinestown, (now Havana), the residence of the celebrated Catharine Montour. The Indians fled in dismay after the battle of Newtown, though a small force would have been sufficient to utterly destroy or drive back the army sent against them, so difficult was the pass through which it was compelled to march. General Sullivan relates in his official account, that on his arrival at Catharinestown, an old woman of the Cayuga nation was found in the woods, who informed him that the Indians arrived the next day after the battle, in great confusion, saying that they were conquered and must flee; that a great many were killed and vast numbers wounded. She heard the lamentations of many at the loss of their relatives, and assured General Sullivan that other warriors had met Brant and Butler, and desired them to return and renew the battle. But they could not be induced to risk another engagement. General S. had depended upon the Oneidas to act as guides and runners through the Indian country, but being disappointed in this, only four remaining with the expedition, he dispatched one of those from Catharinestown to the Oneida Castle, with an address, calling upon all who were friendly to the Americans to prove the sincerity of their professions by joining his forces immediately.--The messenger, Oneigat, was also instructed to give his nation an account of the battle of Newtown. He did not return and join the expedition until near its close; but on his return, reported that a council was convened and his people were greatly rejoiced at the news which he bore, and that 70 warriors had set out with him to join the army, and 30 more were to follow the next day. On their arrival at the Onondaga village they learned that Sullivan had advanced to Kanadesaga, and wanted no more men, except a few guides; and after transmitting to him an address, the Oneida warriors turned back. The address was one interceding in behalf of a clan of Cayugas who had claimed to be friendly to the United States. General Schuyler declared, in reply, that the Cayugas should be chastised, for their whole course had been marked by duplicity and hostility. The state of civilization to which the Six Nations had arrived can scarcely be realized by those who are accustomed to look upon all Indians as the same roving savages, living in the rudest of huts, with scarcely enough of the habits of civilized life to separate them from the beasts of the field. They had several towns and many large villages laid out with considerable regularity. Some of their houses were framed, had chimneys, and were painted. Their fields of corn and beans were large, and their orchards of apples, pears and peaches were extensive and flourishing. Sullivan’s expedition swept over it as with the besom of destruction. At Catharinestown, all of the houses, 30 in number, were destroyed, and the fields and orchards laid waste. On the 4th of September the army advanced from Catharinestown down the east shore of the lake, destroyed the small settlement at Peach Orchard, and proceeded down the lake to Kandaia, a village of about 20 houses, which was burned, and one day spent in destroying the fields and orchards in the vicinity. On the 7th, the army crossed the outlet of Seneca Lake and advanced upon Kanadesaga, the Seneca capital, containing about 60 houses, with orchard’s and gardens rich with the autumnal harvest. It was Sullivan’s intention to surround the town and take it by surprise; but Butler was unable to induce the Indians to make a stand, and their capital was abandoned before the army reached it. Here, as elsewhere, the work of destruction was complete. From this point a detachment of 60 men was sent back to Tioga with the sick, while the main army advanced to Canandaigua, destroying 23 houses; thence they proceeded to Honeoye, and after destroying the town, established a strong garrison, leaving the heavy stores and one field piece. The army then advanced towards Genesee, the great capital of the western tribes. Several towns were destroyed on the route. While delaying to bridge a creek, Lieutenant Boyd was sent out with 26 men to reconnoitre Little Beardstown. Having accomplished his object, he was returning to re-join the main army, when he was surrounded by several hundred Indians. He made several efforts to cut his way through their line, but without success. A few only of his party escaped; one besides himself was taken prisoner, the others were slain. Lieutenant Boyd was tortured in the most shocking manner that savage ingenuity could devise, and was only relieved by death. "But the entire army was immediately engaged in destroying it, and the axe and the torch soon transformed the whole of that beautiful region from the character of a garden to a scene of drear and sickening desolation. Forty Indian towns, the largest containing 128 houses, were destroyed. Corn, gathered and ungathered, to the amount of 160,000 bushels, shared the same fate; their fruit trees were cut down, and the Indians were hunted like wild beasts, till neither house nor fruit tree, nor field of corn nor inhabitant remained in the whole country. The gardens were enriched with great quantities of useful vegetables of different kinds. The size of the cornfields, as well as the high degree of cultivation in which they were kept, excited wonder, and the ears of corn were so remarkably large that many of them measured 22" in length. So numerous were the fruit trees that in one orchard they cut down 1500." "Father, the voice of the Seneca nation speaks to you; the great counselor, in whose heart the wise men of all the Thirteen Fires have placed their wisdom. It may be very small in your ears, and we therefore entreat you to hearken with attention; for we are about to speak to you of things which to us are very great. When your army entered the country of the Six Nations we called you the Town Destroyer, and to this day, when that name is heard, our women look behind them and turn pale, and our children cling close to the necks of their mothers. Our counselors and warriors are men and cannot be afraid, but their hearts are grieved with the fears of our women and children, and desire that it may be buried so deep as to be heard no more." Having completed the objects of the expedition to this point, Gen. Sullivan set out on his return, September 16th, and arrived at Tioga Point on the 30th of the same month. It is in connection with this expedition that we first find the name of the celebrated Seneca orator, Red Jacket, mentioned in history. He was born in 1750, near Canoga, in Seneca County. According to his own account, he was first inspired with a desire to become an orator by listening to the renowned Logan, at an Indian council held in the valley of the Shenandoah. Though many of the celebrated Indian orators were present, Red Jacket was most charmed by Logan, and resolved to take him for a model. On his return home he devoted himself to study, spending much of his time in the forests alone, and by the roaring waterfalls, that he might train his voice for large assemblies. His mother was accustomed to reprove him for his absence, and question him as to the cause. Though loth to answer, when hard pressed he would reply that he had been "playing Logan." The falls at Havana was one of the places to which he would resort for practice, thus imitating the great orator of the Greeks, who practiced by the roaring sea. Thus it will be seen that his command of language and his power over the multitude were the result of long and persistent effort. "Beginning at the north-west corner of the township of Chemung; thence running easterly along the northern boundary of the said township of Chemung, until it strikes Owego River, being the west bounds of the 10 townships added to Massachusetts; thence northerly along said bounds of the township of Dryden, being one of the military townships appropriated for the use of the troops of this State; thence westerly along the southern boundary of the townships of Dryden, Ulysses and Hector, to the south-western part of Seneca Lake; thence west until the line strikes the Pre-emption line; thence southerly along the said Pre-emption line to the place of beginning." The price was three shillings and four pence per acre, 1/6 part of the purchase money to be paid, with lawful interest, in six months, and the remainder in two equal installments, one in nine months and the other in 18 months. The Military Tract, of which Hector formed a part, embraced 26 townships, appropriated as bounty to the soldiers of the Revolution, giving each non-commissioned officer and private 500 acres. The land was surveyed into townships, each containing 100 lots one mile square. Congress also passed a law giving 100 acres to each soldier, this land lying in Ohio. Arrangements were subsequently made to allow the soldiers to draw the whole 600 acres in this State, by their giving up their claim to the Ohio lands. The first settlements were made on Catharine’s Creek, near Havana, in 1788, and on the shore of Seneca Lake in 1790, and before the commencement of the present century settlements had been commenced in nearly all the towns now embraced in the County. Since this County has had a separate organization, little has occurred worthy of special record in a work like this. At the outbreak of the Rebellion, Schuyler, like the adjoining Counties, responded nobly to the call to arms, and from the farm and the workshop the strong and brave went forth to battle for freedom and Union. The census reports that 854 enlisted in this County, 164 of whom died in the service or from injuries received in the service. Considering the population, this record is one that does credit to the patriotism of the County. The County is divided into 130 school districts, in which are 114 school houses, requiring 123 teachers. There are 16 joint districts, in which the school houses are in adjoining counties. The whole number of children of school age in the County at the last report was 6,139; the number attending school 4,740, and the average attendance 2,156. The amount expended for schools during the last year was $28,388.26. CATHARINE, named from Catharine Montour, was formed from "Newtown," (now Elmira, Chemung County), March 15th, 1798. Catlin and Veteran (Chemung County), were taken off in 1823. A part of Newfield, (Tompkins County), was annexed June 4th, 1853, and a part was annexed to Cayuta, April 17th, 1854. Montour was taken off in 1860. It lies in the south-east part of the County, and borders upon Tompkins on the east and Chemung on the south. Its surface is a hilly upland, broken by the deep valleys of the streams. Cayuta Lake lies in the north-east part, and its outlet, Cayuta Creek, flows south into the Susquehanna. The soil is chiefly a gravelly loam, mixed with clay. Odessa, (p. v.) in the western part of the town, contains two churches, several mills and about 250 inhabitants. Catharine, (p. v.) situated in the south-west part of the town, contains two churches and about 30 houses. Alpine, on the south-east border, is partly in this town. The first settlements of this town were made about the commencement of the present century, near Odessa and Catharines. The life of the early settlers was similar to that in other parts of the country. Through that energy which characterized the pioneers of the surrounding towns, the forests disappeared, and fertile fields and verdant meadows are now interspersed throughout the town. The productive resources of the town in some respects are without a rival. On the 22d day of July, 1855, Mr. Foster Ervay became the happy father of four children at one birth, three girls and one boy. Their names are Ida A., Irvin A., Ada A. and Joy O. The boy and one girl are still living. The population of the town in 1865 was 1,622, and its area 19,016 acres. The number of children between the ages of five and 21 years is 599; the number attending school during the past year was 494, and the average attendance 327. The amount expended for schools the same year was $2,480.15. CAYUTA was formed from Spencer, (Tioga County), March 20th, 1824. Parts of Catharine and Erin (Chemung County), were annexed in 1854. The town was transferred from Tioga to Tompkins County, March 22d, 1822. It is the south-east corner town of the County. The surface is a hilly upland. Cayuta Creek flows south-east through the town, in a narrow, deep valley, bordered by steep hillsides from 300 to 600 feet high. The soil is a clayey and gravelly loam. Cayuta, (p. v.) situated on Cayuta Creek, is a small village a little north of the center of the town. Alpine, (p. v.) situated on the north line of the town, contains several mills and 25 and 30 houses. The first settlement was made in the valley of the Cayuta, near West Cayuta, in 1801, by Captain Gabriel Ogden, Rev. David Janes and Joseph Thomas. The first two were from Tioga County, and the last from Athens, Pennsylvania. In 1803, Hermon White, Benjamin Chambers and Jeremiah Taylor, settled in the same vicinity, and Moses Brown, Langstaff Compton and others in 1804. The first birth was that of Rosetta, daughter of Jonathan Thomas, in January, 1804; the first marriage was that of Ebenezer Edwards and Sarah Ogden, in 1804; and the first death that of Joseph Thomas, in July, 1802. Robert Lockerby taught the first school, in a house belonging to Elder Janes, in the winter of 1805. Captain Gabriel Ogden kept the first inn, at West Cayuta, in 1805; Jesse White erected the first saw-mill, on the east branch of the Cayuta, in 1816, and John Ennis the first grist-mill, two miles below West Cayuta, in 1817. The first religious services were held by Rev. David Janes, (Bap.) at his own house, in 1802. The population in 1865 was 636, and its area 12,555 acres. The whole number of children of school age is 198; the number attending school 146, and the average attendance 67. The amount expended for school purposes in 1867 was $713.15. DIX, named from Hon. John A. Dix, was formed from Catlin, (Chemung County), April 17th, 1835. It lies upon the west side of Catharine’s Creek, and extends from the head of Seneca Lake to the south bounds of the County. The surface is chiefly a rolling and hilly upland, and the summits of the hills are from 400 to 700 feet above the lake. Catharine’s Creek, and several smaller streams, drain the town. The soil is chiefly a fine quality of gravelly loam, and very productive. Watkins, (p. v.) named from Dr. Samuel Watkins, an early settler in the village, is situated upon the line of Reading, at the head of Seneca Lake. It was incorporated as "Jefferson," April 11th, 1842, and its name was changed April 8th, 1852. It is a station on the railroad and on the canal. It is the County seat, and contains the County buildings, two banks, five churches, four hotels, two founderies, two planing mills, two malt houses, a brewery, several carriage shops and some over 2,000 inhabitants. Several steamboats ply between Watkins and Geneva. Steam tugs and sailing craft also ply its waters in all directions. Beaver Dams, (p. v.) in the south-west corner of the town, contains two churches, several manufactories and about 30 houses. Townsend, (p. v.) near the west line of the town, contains a church, several mills and about 40 houses. Crawford Settlement (Moreland p. o.) lies near the south line, and contains two churches and about 30 houses. Freer’s Glen is a remarkable ravine near the village of Watkins, that has recently been opened to the public, and is one of the most beautiful of the natural curiosities of the country. Though essentially different from Niagara and Mammoth Cave, it is in some respects no less interesting and wonderful. The Glen was first opened to visitors in 1863, by the erection of bridges and stairways, rendering the first section accessible. Since that time improvements have been extended by the proprietors until the Glen is now open to visitors for about two miles. The Glen appears to be a cleft or seam in Glen Mountain, worn away by the stream which flows through it. The rocks are soft, and the changes that are produced by the annual freshets are such as to render this theory probable. The entrance to the Glen is a vast amphitheater, semi-circular in form and inclosed by high walls of soft slaty rock. The ruins of an old mill, upon the stream that flows through the center of it, adds to the picturesqueness of the scene. A narrow cleft in the perpendicular wall of this amphitheater appears at the further end, upon the north side of which is a staircase, leading to the first of a succession of glens, each characterized by some peculiarity from which it receives its name. Glen Alpha is first entered on ascending this staircase. From an angle in the rocks a stream of water pours out, and falls in a beautiful cascade to a pool 30 feet below. This is crossed by a bridge, from the middle of which we get a very fine view up the Glen. The high and irregular walls on each side approach each other towards the summit, almost forming an arch, through which the stream, broken and scattered by the obstructions in its course, rushes to the cascade below. Crossing the bridge and ascending a flight of steps cut in the rock, and following up the stream, we reach the entrance Gorge, whose rock walls are rendered peculiarly beautiful by the various tints and colors which they exhibit. Here we find the Minnehaha; not the one immortalized by Longfellow, but a diminutive namesake, dashing over the rocks in all directions, and forming one of the most beautiful features of this part of the Glen. The Labyrinth, a wild and romantic section, whose most interesting feature is the Gnome’s Grotto, lies beyond. This Grotto is a path leading behind the Cavern Cascade, which rushes over the rocks above into the boiling pool, 40 feet below. From this point a stairway, some 50 feet in height, leads up to the Glen Obscura. From the top of the stairs is seen a remarkable figure resembling the head and features of an Indian, and called the Profile Gorge. Passing on from this point we soon arrive at the Glen Mountain House, an unpretending structure, where the traveler may rest and procure refreshments. Leaving the Mountain House, we pass on to Glen Cathedral, which no pen can describe. It is in the form of a vast oblong amphitheater, nearly a quarter of a mile in length. The perpendicular walls on either side rise to a great height, and are draped with rich foliage, pendant vines and mosses of great beauty. The floor is nearly level, and the veins upon the surface of the rock give it the appearance of having been laid in diamond-shaped blocks. For grandeur and sublimity this is unsurpassed by anything in the Glen. A cascade falls over the rocks at the upper end, forming the Orchestra, which continually pours forth a hymn of praise to the great Creator. This cascade pours its waters into the Pool of the Nymphs, a beautiful natural basin of great depth. The water is so clear that the smallest objects are clearly discernable where the water is 10 or 15 feet deep. Passing a series of miniature rapids, we come to the foot of the Grand Staircase, which leads to the Glen of the Pools. As we ascend this we obtain a splendid view of the Cathedral. We seem suspended in mid-air, with the section which we have just passed spread out before us. The stair-case is in two sections, and 70 feet in height. The Glen of the Pools is a succession of subterranean grottoes and deep basins that have been washed out of the rocks by the action of the water for a long series of years. Above this we pass the Triple Cascade and the Rainbow Fall. Passing behind the latter, which is formed by a stream falling from the hill upon the south side of the Glen, we have a beautiful view of the surrounding objects through the thin veil of transparent water that intervenes. A rainbow formed in the spray adds greatly to its beauty during certain hours of the day. Passing on and up a short staircase we come to another Glen which contains the Shadow Gorge. The path through this is cut out of the rock, and the passage is difficult, though no series accidents have ever occurred in the Glen. Passing on in our course, we take a view of Pluto Falls and the Spiral Gorge, and enter Glen Arcadia. Here the view is enchanting, and we would gladly linger and gaze upon the picture spread out before us, but we pass on to the Arcadian Falls, a beautiful cascade falling some 20 feet into a natural grotto. This is as far as the Glen has been made accessible to visitors. Thus we have taken the reader through the Glen, giving him but a faint idea of its beauties, and passing over many things quite as interesting as any we have attempted to describe. This point is two miles from the entrance, and 800 feet above the level of Seneca Lake. Days might be spent here in viewing the ever changing features of this mighty gorge, and yet be continually charmed by new beauties. Situated at the head of Seneca Lake, whose waters extend for 40 miles to the north, it can hardly fail to become a place of great resort to the pleasure seekers of our country, as its charms become more widely known. The first settlements were made near the head of the lake and along the valley of Catharine’s Creek, about the commencement of the present century. George Mills was among the first settlers in town; he lived to a great age, upwards of 95. Judge John Dowe, David Culver and John and William Watkins, were also among the early settlers. The first settlers at the village of Townsend were Claudius Townsend, Consider B. Evens, Jonas Blower and Dods Benson, in 1823. Ebenezer Perry was the first settlers at Beaver Dams. At this place two dams were built across Port Creek by beaver; one of the dams still remains. A swamp, formed by the lower dam, is an alluvial deposit, 400 feet deep, from which lime is made. The first church edifice (Bap.) was erected in 1833, at Townsend. The population in 1865 was 3,432, and the area 22,196 acres. The number of children of school age in the town is 1,181; the number attending school 831, and the average attendance 327. The amount expended for school purposes in 1867 was $3,408.65. HECTOR was formed from Ovid, (Seneca County), March 30th, 1802. It is the south-west corner township of the Military Tract, and the north-east corner town of the County. The surface is a rolling upland; its highest summits are from 500 to 700 feet above Seneca Lake. The bluffs bordering upon the lake are from 100 to 300 feet high, and nearly perpendicular. It is drained by a large number of small streams, which flow into Seneca and Cayuga Lakes. Hector Falls, in the south-west part of the town, is a beautiful cascade upon a creek flowing down the bluff which borders the lake. The soil is a clay, sandy and gravelly loam, in some places underlaid by hard-pan. Perry City, (p. v.) is situated upon the east line of the town, and contains about 150 inhabitants. Mecklenburgh, (p. v.) is situated about two miles south-west of Perry City, and contains three churches, several mills and about 400 inhabitants. Reynoldsville (p. v.) lies near the center of the town and contains a church and about 150 inhabitants. Bennettsburgh, (p. v.) in the south part, contains a church, several mills and about 30 houses. Burdett (p. v.) is situated in the south-west part, and contains three churches, several manufactories and mills, and about 400 inhabitants. Peach Orchard, (Hector p. o.) in the north-west part, contains three churches and about 40 houses. It received its name from the fact of there being a large peach orchard in that vicinity when the town was first settled. Polkville, in the north-west part, contains a church and about 20 houses. Searsburgh, (p. o.) in the north-east part, is a hamlet, containing two churches. North Hector, in the north-west part, and Cayutaville, in the south-east part, are post offices. Steamburgh is a hamlet in the north part. Settlement was commenced in 1791, in the north-west part of the town, on the bank of the lake, by John Livingston and William Wickham. Reuben Smith, and his sons Reuben, Jabez, Samuel, Harvey, Caleb and Chauncey W., from Canaan, Conn., settled on Military lots 20 and 21, in 1794; Richard Ely and Grover Smith settled a little north of "Peach Orchard," and Daniel Everts south of the same place, in 1795. These were all from Salisbury, Conn. According to the State Gazetteer, Polly Everts was the first child born in the town; but Rev. Mr. Hotchkin, in his History, says "A daughter of Mr. Fawcett’s was the first white child born in the town of Hector. She was carried on horseback, soon after her birth, into the region of Northumberland, in the State of Pennsylvania, to receive the ordinance of baptism." A son of Captain Ely was the first white male child born in the town. The first marriage was that of Stephen Pratt and Betsey Livingston; and the first death that of William Wickham. The first school was taught at Peach Orchard by John Livingston. William Wickham kept the first inn, near Peach Orchard, and John B. Seely the first store, at Hector Falls. The first grist-mill and carding machine were put in operation, at the same place, by Samuel B. Seeley. The first church (Presb.) was formed by Rev. Mr. Stewart, at Peach Orchard, in 1809. The census of 1865 gives the town a population of 5,048, and an area of 63,098 acres. The number of persons of school age in 1867 was 1,662; the number attending school 1,266, and the average attendance 631. The amount expended for school purposes in 1867 was $8,575.50. MONTOUR was formed from Catharines, March 3d, 1860. It lies upon the south border of the County, a little east of the center. The surface is a hilly upland, broken by the deep valleys of the streams. Catharine’s Creek flows along the west border, in a deep ravine from 300 to 700 feet below the summits of the hills. The soil is chiefly a gravelly loam, mixed with clay. Havana, (p. v.) incorporated May 13th, 1836, is situated on Catharine’s Creek, about three miles from the head of Seneca Lake. It is a station on the canal, and also on the railroad, and contains three churches, two newspaper offices, two banks, the People’s College, a hotel, two flouring mills, two founderies, one woolen factory, a plaster mill, extensive stone-ware works, a planing mill, a spoke and hub factory and several other establishments of less importance. The population is about 1,500. The People’s College was incorporated April 13th, 1854, and was located at Havana, January 8th, 1857. The Institution is now under Masonic auspices, in connection with an Asylum for Masonic orphans. There are several natural curiosities in the vicinity of Havana worthy of more than a passing notice. Havana Falls is a beautiful cascade a short distance west of the village. It is upon a small stream that pours its waters into the Inlet of Seneca Lake. But the chief object of interest, and one that should be seen to be appreciated, is McClure’s Glen, a beautiful ravine worn into the rocks by the action of the water which for ages has been pouring its torrents into the basin of Seneca Lake. Until recently, the beauty and sublimity of the Glen were hidden from all except some daring adventurer whose love of nature, unimproved by art, led him to penetrate its wild and rocky chasms, or the more quiet recesses, and listen to the sweet murmur of the "Whispering Falls." The Glen was first made accessible to the public in the summer of 1867, by the construction of walks and the erection of bridges and stairways through its rugged and winding way. Near the entrance to the Glen is a beautiful grove, affording a fine resort for pic-nic parties. Here the Free Masons held a grand pic-nic on the 18th of September, 1867, at which the number in attendance was variously estimated at from 5,000 to 10,000 persons. As we enter the Glen, the Portal Cascade first appears in view. Here the water of McClure’s Creek makes its final plunge into the basin of Seneca Lake. Passing along the narrow path we will next take our stand upon Sylvan Bridge that spans the stream above the first falls, and gaze for a time upon the beauties of Glen Montour, as the first section is called. Pursuing our course, the Eagle Cliff Falls appear in view. These are the highest in the Glen, the unbroken fall of water being about 50 feet. The cliffs tower above the summit of the falls to the height of more than 100 feet, rendering the scene peculiarly sublime and impressive. Ascending the oak stairway, the second subdivision of the Glen, The Pride of the Senecas, opens to our view. The stream appears to emerge from a spacious room in the form of an L. The main passage is 60 feet in length and about 25 in width, and the average height of the sides about 30 feet. From different stand-points in this section of the Glen we obtain views that are exceedingly beautiful and rarely equaled. We cannot stop to describe the beauties of the Curtain Cascade, or the wild and rugged scenery of Central Gorge, as viewed from the winding stairway. This Gorge varies in depth from 50 to 100 feet. Leaving it and crossing the Cavern Bridge, located at the entrance of the Glen of the Caverns, we will pursue our way, taking a view of Hermit’s Cave and the Whispering Falls as we pass along to Glen Chaos, where the rocks appear to have slid down into the ravine from its adjacent sides, and here lie imbedded in one chaotic mass. The Glen of the Echoes, and Echo Falls, will beguile us for a time ere we reach the Glen of the Pools. Here are numerous cavities, varying in size and shape, some of them circular and very beautiful. Passing the Fairies’ Cascade and the Summit Falls, we emerge to the highlands which overlook Seneca Lake. In taking the reader through the Glen, we have done little more than to give the names of some of the principal localities, all of which are suggestive, and must now leave him to visit the Glen, and see for himself the work of the Almighty’s hand. The first settlement of the town was made at Havana, in 1788, by Silas Wolcott and a Mr. Wilson. George Mills, William McClure, Phineas Bowers, John King, and families by the name of Stevens, settled in the town, near Havana, in 1789-90. Anthony Broderick kept the first school, in a house owned by Phineas Bowers, in 1792-93. Silas Wolcott kept the first inn, soon after his settlement, and Isaac Baldwin and George Mills the first store, in 1805, at Havana. Phineas Bowers erected the first grist and saw-mills, at or near the village. Catharine Montour, in honor of whom this town was named, was a native of Canada, a half breed, her father having been one of the early French Governors; probably Count Frontenac. During the wars between the Six Nations and the French and Hurons, Catharine was taken prisoner, carried to the Seneca country, adopted and reared as one of their own children. When arrived at a suitable age, she married one of the distinguished chiefs of her tribe, who distinguished himself in the wars of the Six Nations against the Catawbas, then a powerful nation living to the south-west of Virginia. She had several children by this chieftain, who fell in battle about the year 1730. She is said to have been a handsome woman when young, genteel, and of polite address, notwithstanding her Indian associations. She was accustomed to accompany the chiefs of the Six Nations to Philadelphia and other places where treaties were made, and from her character and manners was greatly caressed by the American ladies. At Philadelphia she was invited into the best circles and entertained at the houses of the elite of the city. She was commonly called "Queen Catharine," and had her residence near the present village of Havana. From the English Colonial Government she received a small salary for many years, on account of her influence with the Indians. The famous "Painted Post," at the confluence of the Tioga and Conhocton Rivers, is said to have been erected to the memory of the son of Queen Catharine. Mr. Mills, the first merchant of Havana, was also one of the first navigators of Seneca Lake. "Mills Landing" was the head of navigation, and from this point, in his Indian batteaux, he transported the products of the soil, and received in return goods brought from New York via Albany, Mohawk River, Wood Creek and Seneca River. As the population increased, he increased the tonnage of his vessels, and did a thriving business. The first sloop launched upon the lake was built under the patronage of Col. Charles Williamson, in 1796, to ply between Geneva and Catharinestown. This event called forth the settlers from their cabins, and was regarded as an event of scarcely less importance than the launching of an ocean steamer in our seaports. It is said that natives of every State in the Union, and of every nation in Europe were present to witness the event. The first steamboat that navigated the lake was the Seneca Chief, and her first trip was made July 4th, 1828. In just 20 years from that day she was destroyed by fire. The population of the town in 1865 was 1,854, and its area 11,323 acres. The number of persons of school age in 1867 was 622; the number attending school 512, and the average attendance 204. The amount expended for school purposes in 1867 was $3,958.64. ORANGE was formed from Wayne, (Steuben County), February 12th, 1813, as "Jersey." Its name was changed February 20th, 1836. A part of Hornby, (Steuben County), was annexed April 11th, 1842, and a part of Bradford (Steuben County), April 17th, 1854. It is the south-west corner town in the County, and is bounded on the east by the pre-emption line. Its surface is a rolling and hilly upland, broken by the deep and irregular valleys of the streams. Mead’s Creek, flowing south-west, forms the principal drainage. The soil is chiefly a gravelly loam. Monterey, (Orange p. o.) situated on Mead’s Creek, in the south part of the town, contains a grist-mill and about 300 inhabitants. Sugar Hill is a post office in the north-east part. The first settlements were made in 1799, by Abraham Rozenback and Samuel Scomp, north-east of Monterey. Henry Switzer, from New Jersey, settled on Switzer Hill, in 1802, and D. Hewitt, from Rensselaer County, was the first settlers at Monterey, in 1811. Abner and Thomas Hurd, and Brigham Young, the Mormon President, were early settlers in the north-east part of the town. William Wilkins, William DeWitt, Andrew Fort, Daniel Curtis, Jedediah Miller and a Mr. Chapman, settled on Mead’s Creek in 1811. David Kimball, and his brother Moses, John Dyer, Sylvester Goodrich, and three men by the name of Hewitt, settled in the town a few years later. Joshua Chamberlain came into the town and purchased the land where the village of Monterey stands, of a man named DeWitt. The north-east part of the town, known as "Sugar Hill," did not receive its name from any considerable elevation in that place, but from the following circumstance: In this place was a fine grove of maples, and the early settlers in the adjacent region, having in their hunting excursions discovered that there were no settlers upon the land, were accustomed to resort thither in the spring and manufacture a supply of sugar for the year; hence the name "Sugar Hill." The settlement in this vicinity was commenced about 1819 or 1820. Lewis Nichols, William Webb, Thomas Horton, Abraham and John Allen, Ebenezer Beach, Mr. Eveleth, Seymour Lockwood, and two families of Comptons, were among the first settlers. Dr. Hibbard and Abraham Lyboult came about the year 1821. After the commencement of the settlement the land was very soon taken up by actual settlers. The fertility of the soil and the proximity to Seneca Lake, their prospective market, together with the easy manner of obtaining land from the office at Bath, contributed to the rapid settlement of the town. The first child born in the town was Elsie Switzer, and the first school was taught by Daniel McDougall, in 1819, near Monterey. Thomas Hurd kept the first inn, in 1816, at Monterey, and Walter Hurd the first store, south-west of the same place. The first church (M. E.) was formed by Rev. Peregrine Hallett, the first preacher. The population of the town in 1865 was 2,094, and its area 29,863 acres. The number of persons of school age in the town in 1867, was 700, the number attending school 544, and the average attendance 247. The amount expended for school purposes the same year was 3,281.88. READING was formed from "Frederickstown," (now Wayne, Steuben County), February 17th, 1809. It lies upon the west bank of Seneca Lake, and is the central town upon the north border of the County. Its surface is a rolling upland, varying from 400 to 500 feet above the lake. The bluffs upon the shore are very steep, and in many places precipitous. The streams are small brooks and creeks. The soil is chiefly a clay loam. Reading Center, (p. v.) situated in the central part of the town, contains two churches, one hotel, a store and several mechanic shops. Reading, (p. o.) in the south-east part, is a hamlet. North Reading is a post office. Judge Dow, from Connecticut, settled at Reading Center in 1790. David Culver followed in 1800. William Eddy, Abner and Timothy Hurd, Simeon and Matthew Royce, Reuben Henderson, Andrew Boothe, Samuel Gustin, John Bruce and Samuel Shoemaker settled within a few years thereafter. Alexander Hinton settled near Watkins in 1802. About 1806, John and James Roberts, Daniel Shannon, Caleb Fulkerson, Richard Lanning, George Plummer and Andrew McDowell settled in the town. Chester Corbett, who is still living in the town, settled here in 1813. The first marriage was that of Elisha Culver and Susan Divins; and the first birth that of Minor Culver. The first school was taught by Ira Parker, at the Center. David Culver kept the first inn, north of the Center, and David Culver, Jr. the first store, at the same place. Eliadia Parker erected the first saw-mill. The first church, (Bap.) was formed by Elder John Goff, in 1810, at Reading Center. The population in 1865 was 1,682, and the area 16,156 acres. The number of persons of school age in 1867 was 472; the number attending school 384, and the average attendance 170. The amount expended for schools the same year was $2,085.12. TYRONE was formed from Wayne, (Steuben County), April 16th, 1822. It is the north-west corner town in the County. Its surface is an elevated upland, divided into several ridges by the valleys of the streams. Its principal stream is Mud Creek, flowing south-west to the Conhocton. Little Lake, upon the west border, is about three miles long and one wide; and Mud Lake, in the south-west corner, is about 1 ½ mile long and ½ a mile wide. These lakes lie in deep valleys, and are bordered by steep hills, in some places precipitous, which rise from 300 to 400 feet above them. The soil is a clay loam. Tyrone, (p. v.) situated in the south part of the town, contains two churches, a hotel, two saw-mills, two grist-mills, a tannery, half a dozen stores and several mechanic shops, and about 300 inhabitants. Weston (p. v.) contains two churches, a hotel, several stores and mechanic shops and about 250 inhabitants. Altay, (p. v.) in the north-east part, contains a church, a hotel, a store and two or three shops. Pine Grove, (p. v.) a hamlet in the south-east part, contains a church. The first settlement was made in 1800, by General William Kernan, of Ireland, upon a lot on a tract of 4,000 acres, purchased by Thomas O’Connor, of the County of Roscommon, in Ireland. Mr. O’Connor lived for some time in a log house on the hill near Little Lake. A son and a daughter accompanied him, the former of whom is Hon. Charles O’Connor of New York City. A large number of Irish immigrants settled upon the O’Connor tract, but after a few years all left by Gen. Kernan. Abraham Fleet, Sen., from New Jersey, and Captain John Seabring, were among the first settlers near Tyrone village, in 1800. Benjamin Sackett, Gershom, Thaddeus and Abram Bennett, and Jonathan Townsend were early settlers. The first birth was that of Simon Fleet. The first school was taught at Tyrone village, by Hugh Jameson; the first inn was kept by Captain Williams, and the first store by Thomas O’Connor, near the north-west corner of the town. The first mill and factory were erected by Tyrone village, by Ralph Opdyke. The first church edifice (Union) was erected by the Presbyterians and Baptists; Rev. Joseph Crawford (Presb.) and Rev. Van Rensselaer Wall (Bap.) were the first preachers. The population in 1865 was 2,073, and the area 22,612 acres. The school population of the town in 1867 was 705; the number attending school 563; and the average attendance 278. The amount expended for schools the same year was $3,855.17.